British rule in India (British Raj) officially dates back to 1858. It was following the great Indian Revolt of 1857 (Revolt of the Sepoys), due in large part to the arrogant conduct of the East India Company, which until then had governed the subcontinent, which became the direct domain of the English Crown, which allowed Queen Victoria to be proclaimed empress of India in 1876. At the end of the nineteenth century, the national movement led by the Indian National Congress, dominated by the Hindu presence, claimed the self-government of the country (Swaraj), gaining strength in India, albeit with very different positions, more or less gradualist about the relationship with British Empire. The British government, which managed the colony through a body of its own officials, left very little room for the Indian presence, often trying to exploit the Muslim component, since the latter was aware that the adoption of a Western representative system would have meant the prevail of the Hindus. Some members of the British ruling class were aware of the explosive situation that was mounting in the country, especially after the revolt that occurred in 1905 against the division of the Bengal region operated by Lord Curzon without taking into account the existing ethnic-religious reality: it will therefore be the British Minister John Morley (the only one who will oppose the war against Germany in 1914) to present a very moderate reform in 1909, which was not intended to favor India’s autonomy but simply to involve moderate Indian exponents in the British colonial administration. 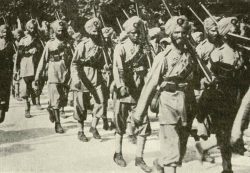 Despite growing resentment against British rule, India proved loyal to the British Empire, bearing witness to this loyalty with more than 800,000 Indians serving in the Allied armed forces, and with at least another 700,000 civilians who contributed directly to the war effort. Over 64,000 were killed, especially in the terrible battles of Ypres in 1915, proof after which the Indian colonial tropps were moved mainly to the Middle East. But India’s contribution was not paid only with blood, but also with gold: revenues from India contributed for more than 146 million pounds to the Allied war effort, after having provided the financial basis for the wealth of the British Empire all along the 19th century. This contribution was accompanied by enormous economic and social difficulties resulting from participation in the war: 93% growth in the cost of cereals, 60% of locally produced goods and 190% of imported goods, causing an impoverishment that was often translated into riots and violent acts, increasing the concern of the British government, impressed by the events of Russia. In 1916, then, the Indian National Congress openly asked for self-government, also following the agreement reached with the Muslims, with the so-called Lucknow pact. The position of the Indian nationalist movement came out much stronger, with the creation of associations that now invoked the Home Rule, exactly as had happened and happened in Ireland. One of them was promoted by a controversial but important figure of the Anglo-Saxon world, among the protagonists of the theosophical movement in the West, Annie Besant, committed for this action in favor of the independence of India, from whose spirituality she has been fascinated. On the one hand, the British government showed openings, especially when, in July 1917, Lord Ewin Montagu issued a favorable declaration to an Indian responsible government, which he would later take form in December 1918, with the so-called Montagu Plan. A declaration that gave hope, in the climate of the celebrated self-determination of peoples, that the demands for independence could be accepted in a short time. On the other hand, however, Great Britain showed to be preparing repression, constituting, since the first months of 1917, a police committee, which took its name from its president, Sir Arthur Taylor Rowlatt, with the mission to investigate the “criminal conspiracies connected with revolutionary movements in India”. Thus, at the end of the war, which had brought the spanish flue epidemic (which would have caused as many as 13 million victims) to India now, the British government, while the Montagu plan remained on paper, put to good use the results of the Rowlatt Committee, issuing on March 18, 1919 the infamous Rowlatt Act, an emergency regulation which envisaged, among other things: arrest without a warrant; detention without trial; trials with a single judge without the right to execute prosecution witnesses; house arrest for suspects; a strict censorship of the press. This provision obviously had a disastrous effect on Indian public opinion, extinguishing the hopes raised by the Fourteen Points and by the Montagu declaration, strengthening Indian nationalism and creating the premises for dramatic events that did not take long to happen.